The high prevalence of chronic pain coupled with the risks associated with the use of prescription medications, particularly opioid analgesics to treat pain, has led to increasing interest in the development of nonpharmacologic treatment options. One such nonpharmacologic treatment category, electromedical devices, is sometimes overlooked. While the different devices within this category share some similarities, in that they all use electrical signals to influence and modulate the perception of pain, they do so through different mechanisms. Some of the electromedical devices deliver electrical signals through the skin that permeate to the nerve fibers underneath the skin, such as transcutaneous electrical nerve stimulation (TENS) units. Others are surgically implanted to deliver electrical signals that reach directly to the nerve fibers traveling through the spinal cord, such as spinal cord stimulators (SCS). In addition to TENS and SCS for pain management, there are devices available to help manage certain injury-related, and oftentimes debilitating, complications associated with muscle or bone injuries. Neuromuscular electrical stimulation (NMES) may prevent atrophy and weakness of the quadriceps muscles following major knee surgeries. After the occurrence of a brain or spinal cord injury, a functional electrical stimulation (FES) may improve weakness in the muscles that lift the toes off the ground during walking, a condition known as foot drop. Chronic, non-healing wounds have been shown to respond favorably when certain types of electrical impulses are applied at the wound site and surrounding tissues. Bone growth stimulators (BGS) can be used promote healing after delayed union or nonunion of fractures. Another potential use is to help improve the healing of spinal fusions, especially in situations where comorbid conditions such as tobacco use, obesity, poor nutrition, diabetes, alcoholism and older age are present. 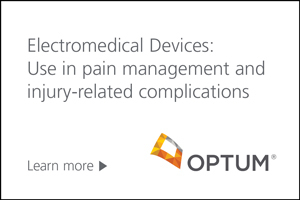 Read our paper, Electromedical devices: use in pain management and injury-related complications, for more insight on these valuable therapy alternatives.